Stopping the flow of oil was one thing, cleaning up the mess was another. 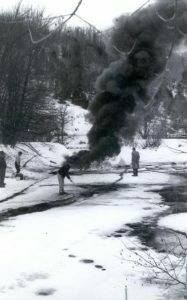 Oil company officials are seen in this photo attempting to burn the oil from an ice covered Black River. The prospect of a new petroleum pipeline passing through North Dakota has created a world-wide uproar. For most people, the fear of such a pipeline breaking is little more than theory. That isn’t the case here in the Northeast Kingdom for those old enough to remember the 1952 Portland Pipeline break. As the publisher of Vermont’s Northland Journal, I have chronicled this disaster, including interviewing people who remember it, and those who took part in the cleanup effort. Following is an article on the topic which appeared in the March 19, 1952 issue of the Newport Daily Express. Top officials of pipeline company here – expect no damage to fish – press efforts for rapid clean up – cut channels in ice. Efforts being made by representatives of the Portland Pipeline Corporation to burn off surplus crude oil which has accumulated in pools along the Black River’s course since the recent break in the Portland to Montreal pipeline met with success yesterday. John L. Creed, general superintendent of the pipeline told the Daily Express that he believed that no damage would result to the fish in the stream by the presence of the scattered coating of oil on the river’s surface. However, he indicated, that attempts will continue to burn oil at various spots where it is gathered. He estimated that at least 25 percent of the oil had evaporated, taking away most of it gaseous content, gasoline, benzene, butane, etc., in the past several days. Employees were having some difficulty in firing the unrefined oil yesterday. Mr. Creed said that tremendous heat is necessary to start combustion and that an initial temperature of nearly 300 degrees, Fahrenheit scale, is required. Channels cut in the river ice allowed the oil coated water to slow up in pools. Workmen then spread wood shavings on the adjoining ice and onto the oily pools. Bales of straw were then thrown into the river, also soaked in kerosene. The whole mass was then ignited. Combustion of the kerosene, oil-soaked straw and shavings supplied heat to burn the crude oil. That straw and shavings acted as a wick soaked up the floating crude oil and the initial heat applied caused it to burn. Inspection of the river channel below the spot where the burning is taking place revealed that the procedure adopted to clean the river of its foreign element was meeting with success, Mr. Creed reported this morning. 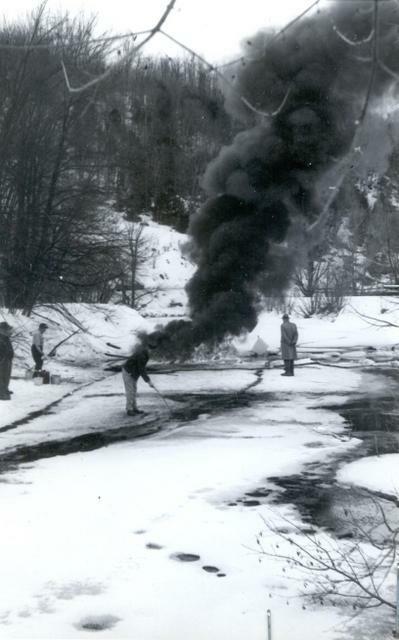 He said that burning oil will continue at the same spot as long as oil is visible floating on the river or ice thaws an breakup of the river ice make the task hazardous to the workmen. “We’re making every attempt to clean up the stream and expect to catch a large percentage of the oil as if floats downstream,” Creed declared. He admitted that the ice and snow had complicated the clean-up campaign, two elements which pipeliners have had to contend with in parts of the world where such pipelines have principally existed up to the present time. He added that had warmer temperatures prevailed the oil would have been dissipated more rapidly and that present burning operations would have been easier since the congealed crude oil would be more fluid. General Superintendent Creed, who has been in the pipeline business for 23 years, mentioned that he had similar troubles with pipelines in the south. Breaks under and near rivers and brooks occurred occasionally but the warmer temperatures there made them easier to contend with and clean up afterwards. The elements of ice, snow, and freezing temperatures have supplied obstacles in the present instance, he admitted, requiring special methods for the peculiar conditions existing here. Creed said that past experience had shown him that fish were not affected by the floating patches of oil. He expects that any remaining oil brought down the river, which is not caught by the burning operations, will be very thinly dissipated in the swamplands adjoin the river during the spring’s high water levels. If some of the oil gets into the extensive Coventry swamp, he added, it should result in discouraging the breeding of mosquitoes. Previously fish and game clubs in this area, and Vermont Federation of Sportsmen’s Clubs, through their spokesmen, had expressed concern about the possible damage to fish and fishing as a result of the pollution of the Ware Brook, Black River, and Lake Memphremagog. The fish and game groups communicated their alarm concerning the oil pollution with Vermont’s Attorney General Clifton Parker. Just how much crude oil in barrels or gallons poured out of the bad break in the pipeline on or about February 19 or 20 is not officially known? Some unofficial estimates placed the amount of it which poured through the one-inch break (completely around the pipeline) at about 3,000 barrels. Others said a possible 165,000 gallons. Two or three days after the break near Kidder Pond, oil showed up as iridescent streaks on top of the water of the Black River as it flowed under the Coventry village bridge. The odor of petroleum was reported as strong by Coventry residents. Parker Brook, on top of the 900 foot elevation, which was the scene of the pipeline break near the Irasburg-Newport Town lines, is within about 40 feet of the break. Thus seepage of the oil started running downhill with the brook water almost at once then into Ware Brook and finally into the Black River, one of the tributaries to Lake Memphremagog. Mild weather and melting snows have in the past few days revealed streaks and pools of oil for three or four miles of the Black River’s course. Monday, Thomas Handy of the Newport Ice Company aided the pipeliners and pipeline officials of the pipeline to open up stretches of ice along the Black River from Coventry Village to the airport bridge which is near the confluence of the river with Lake Memphremagog. At the latter spot, ice was removed entirely across the river and apparently no oil had passed that point. However, at other points, particularly nearer Coventry, the cakes of ice which were removed showed blacked area where the oil had penetrated. Black oily scum appeared in the open water which filled the ice freed channels. General Superintendent Creed said that there had been other minor breaks in the pipeline since it was laid down in 1941 but that the recent February mishap had been the one of its kind. The break near Kidder Pond was at one of the welded seams between two lengths of pipe. It is surmised that there may have been a slight defect in the welding which made it possible for the frost contraction of the metal line to pull the joint apart. The first indication of trouble on the line at the time of the break was when the pressure gauges at the nearest pumping station at Lancaster, New Hampshire fell off 300 pounds. Lock gates were immediately closed at Highwater , Quebec, and West Burke, to prevent siphonage the crude at the break. For almost 15 years, the Northland Journal has been the only magazine dedicated to sharing and preserving the history and heritage of the Northeast Kingdom. The monthly magazine is filled with stories of the Kingdom from an earlier time as told by the people who lived it. Each issue is also filled with historic photos of the region. The Journal comes in print and electronic versions.